Search Armor should protect your browsers, but our research team is doubtful whether or not it is capable of fulfilling its promises. The program created by Colombi Tech Ltd. has an official website, searcharmor.net, but the installer provided does not work. Unfortunately, this does not mean that this program is no longer active. In fact, it is impossible to know if the installer on this site was ever active. All in all, whether or not you have downloaded Search Armor from its official website, you should delete it from your operating system. Continue reading to learn all that you need to know about the removal of Search Armor. According to the research we have conducted in our internal lab, Search Armor comes from the Lyrics family. Although this program has nothing to do with music or lyrics, it was created using the same framework as Halt-it, Find-a-deal, and various other unreliable programs that we advise removing. 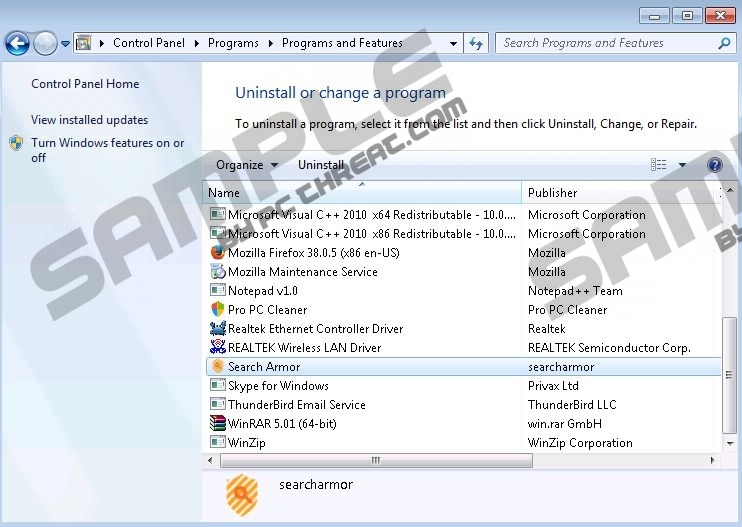 Once installed, all of these programs act as adware – advertisement-supported software – as they show pop-ups and other kinds of advertising. These ads will keep showing until you delete Search Armor (or its clones), and this is very important because they could be misleading and even malicious. Even though Search Armor should stop unreliable programs from changing the search settings on your web browsers, we cannot identify it as a reliable security tool. Reliable security tools would not show sponsored content that could route to unpredictable third-party sites, and this is a possibility with Search Armor. The ads injected by this program are served by unknown advertising servers, and parties using them are unknown as well. As you can guess, this is a vulnerability that could be exploited by malicious parties. Even if you are not bothered by suspicious ads, you should delete Search Armor to avoid potentially unreliable parties. Did you know that Search Armor can come packaged with other programs? Considering that this program does not have an official installer, this is not that surprising. Of course, you cannot ignore the fact that this ad-supported program could be installed along with unfamiliar programs because they might be unreliable as well. You might be able to identify malicious threats that require removal yourself, but we suggest using a malware scanner. This program will not miss any malicious files or programs, which means that you will be able to create a plan that will help you delete all computer threats. Are you considering removing Search Armor manually? This is not a program that is difficult to delete from your browsers. If you find that you cannot uninstall this adware using the guide below, terminate the process called “searcharmor.exe *32” first. Right-click the Taskbar and select Start Task Manager to find this process. Unfortunately, we cannot promise you that you will be able to delete all other threats in an easy manner. Automated malware detection and removal software can inspect your operating system, delete malicious threats, and protect your operating system from them at the same time. Needless to say, installing this software is what we recommend. Select Control Panel for more options and click Add or Remove Programs. Select Uninstall a program and right-click Search Armor. Quick & tested solution for Search Armor removal.